Competition alumni mark the national event’s launch by taking part in a “mixed reality” training challenge. Edmonton, Alberta, June 4th, 2018– This morning, the 2018 Skills Canada National Competition (SCNC) was kicked off at the Edmonton EXPO Centre. SCNC is held annually to encourage students and apprentices to excel in their skilled trade or technology field, and to create awareness of the many incredible opportunities available to youth who have not yet decided their career path. Special guests at the launch included Larry Slaney, Director, Canadian Training, from UA Canada, the presenting sponsor of the Skills Canada National Competition, John Oates, President of Skills/Compétences Canada and Skills Canada alumnus; Alexandre Sidorchuk, WorldSkills Team Canada 2017 competitor in Aerospace Technology and Anne Matiowsky, WorldSkills Team Canada 2017 competitor in Beauty Therapy. Slaney, Oates, Sidorchuk and Matiowsky all participated in a “mixed reality” challenge to kick off the event. 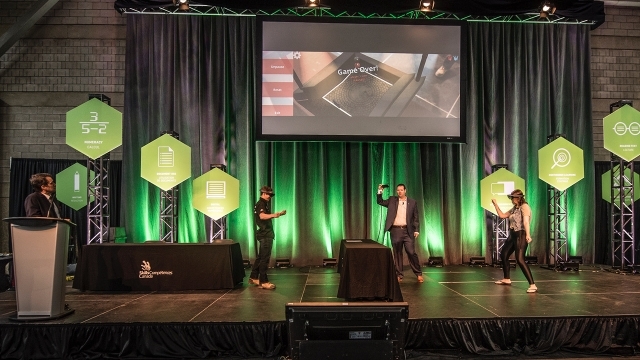 “Mixed reality” is a type of innovative virtual training method used by UA Canada to simulate working conditions using virtual reality. SCNC will have over 550 competitors from across Canada competing in over 40 skilled trade and technology Skill Areas for the opportunity to be named the best in the country, in their chosen field. Several industry celebrities are onsite for SCNC events, including Sherry Holmes, Contractor, Part-time Designer, & weekend DIYer, Paul Lafrance, The “Deck Guru”, and Kate Campbell, HGTV Star and Founder of KateBuilds Inc. and Mandy Rennehan, Blue Collar CEO™ & Founder of Freshco.ca. Throughout the two-day competition, SCNC is expecting approximately 6,000 student visitors, who will have the opportunity to experience over 50 Try-a-Trade® and Technology activities, and participate in many types of Essential Skills programming. The Closing Ceremony, where the results of the competition will be announced, will take place on June 6th, from 12:00pm – 2:30pm, at the Edmonton EXPO Centre, in Hall D.
Skills/Compétences Canada was founded in 1989 as a national, not‐for‐profit organization that works with employers, educators, labour groups and governments to promote skilled trades and technology careers among Canadian youth. For information on Skills Canada’s programs and competitions visit www.skillscanada.com. For more information about SCNC visit: www.skillscompetencescanada.com/en/programs/skills-canada-national-competition. MEDIA CONTACT: Michèle Rogerson,micheler@skillscanada.com, 613-266-4771.